For many motorists, driving with a pet means taking your best companion along for a ride. Of course, there are also instances that require you to take your pet in the car. For most drivers this means letting the dog jump in the front seat, opening the window and letting the animal freely enjoy the ride. After thousands of accidents have cost the lives of animals, especially pet dogs, new safety products have been developed to restrain pets in a vehicle. New research is seeking to determine which pet restraints are actually safer. While crash test dummies have been used to test the safety of features such as seat belts and car seats, up until recently there were no such tests performed on safety features for animals. Our Boston car accident attorneys understand that car accidents can be devastating. We are committed to keeping Massachusetts motorists safe and staying abreast of motor vehicles safety features for families, including pets. Even though the majority of pet car restraint manufacturers have claimed that their products were tested, there is no governing agency to enforce safety protocols and test standards. Now Subaru and the Center for Pet Safety have partnered up to conduct standard safety tests on these pet products. Just like seat belts and car seats, improper usage or the wrong harness can cause more damage that not wearing a restraint at all. 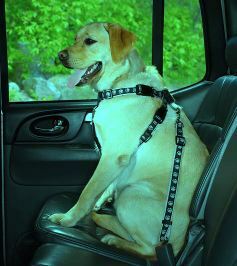 Many pet owners who routinely ride with their animals do not know the dangers of improperly harnessing a pet. In addition to education and promoting pet safety, Subaru and the non-profit company are working collaboratively to ensure the future of safe pet restraints. A division of the National Highway Traffic Safety Administration has conducted rigorous crash testing on the most commonly available harnesses. The crash tests were intended to be realistic enactments of a collision and specially designed crash test dogs. The crash test dogs were modeled after 3 different sized dogs–a terrier, border collie, an a golden retriever. According to the results, there were significant flaws in the design of restraints on the market. There was only one harness that kept a dog from being launched from the seat. It was the only restraint that offered safety protection to other passengers as well. Safety harnesses can also prevent injury to other passengers in the car, including children. If a pet is launched from a seat in a collision, it could strike another passenger.